Nathan Hartswick, comedian and Vermont Comedy Club founder, performs March 26 at Comedy and Crepes, a weekly stand-up comedy series which meets Mondays at The Skinny Pancake. On a small stage covered in Christmas lights, comedians grabbed the attention of The Skinny Pancake audience. 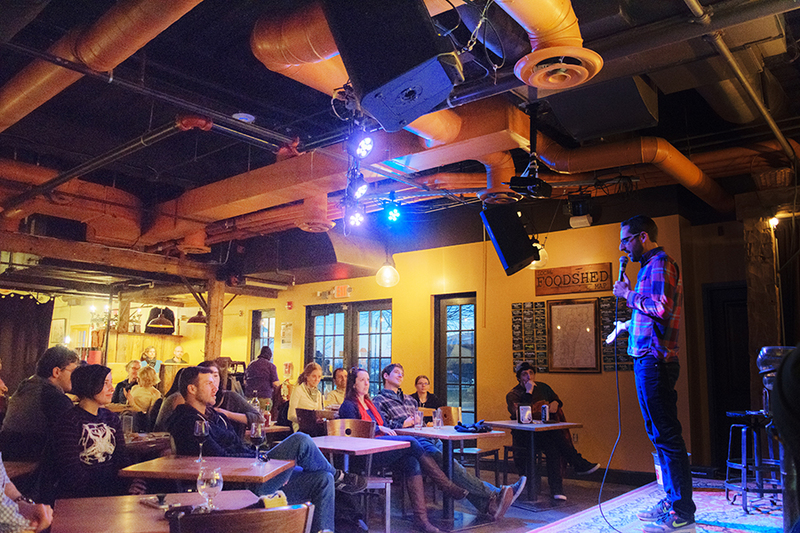 Comedy and Crepes is a weekly stand-up comedy series which meets 7 p.m. Mondays at the restaurant’s downtown location. Comedians Nicole Sisk and Carl Sonnefeld host the series, which began in June 2016. Sisk said that fellow comedian Kendall Farrell originally started the show to provide more opportunities for Burlington comedians to showcase their work outside of the Vermont Comedy Club. “It’s been cool to watch audiences come out in bigger numbers every week,” Sisk said. Sisk opened the show March 26 with a set that addressed bisexuality, buying condoms and her love of food. The night featured sets from local talent Nilima Abrams, Tyler Denton, Nathan Hartswick, founder of the Vermont Comedy Club, and Kathleen Kanz, winner of Vermont’s Funniest Comedian 2016. Each week, the series brings in a headliner. On March 26, the role was filled by Boston comedian Andrew Mayer. Mayer has a “quirky delivery and an offbeat sense of humor,” the Boston Comedy Festival website states. Mike Paternoster is a regular audience member. “It’s a really great show,” he said, citing both The Skinny Pancake’s great food and the consistent quality of the shows as reasons for coming back. Paternoster, who moved to Burlington a few months ago, said that he immediately felt welcomed by the city’s comedy scene. He noted how organizations, such as the Vermont Comedy Club, took him in. “It’s really reflective of how Burlington is just a great community,” he said. Paternoster mentioned that he felt this spirit was true of Burlington overall. Comedy and Crepes starts at 7 p.m. every Monday night at the Lake Street Skinny Pancake with no cover charge.